I have long participated in SleuthSayers, commenting on posts and occasionally writing guest posts, but this marks my debut as an official member of the tribe. Thanks, y’all, for inviting me to join. I wrote my first professionally published story when I was 17, sold it when I was 18, and saw it published when I was 19. That’s the story I tell, and the story I’ll continue to tell, but it isn’t the truth. The truth is more complex and involves my committing one of the worst crimes a writer can commit short of plagiarism. My parents divorced well before I entered kindergarten, and the late ’50s and early ’60s were not filled with opportunities for single mothers. We were poor, we moved often, and we had limited entertainment choices. (We did not own a television until I was in the third grade, but we did curl up in my mother’s bed late on Saturday nights to listen to rebroadcasts of old radio dramas.) So, my mother taught me to read, and one of the first things we did each time we moved was locate the nearest library. Through reading, I could be anyone, go anywhere, and do anything. Like many of us, I knew at an early age that I wanted to be a writer. Unlike most, I began seeking publication almost immediately. When I was in the eighth grade, I wrote my first short story, “The 1812 Battle at Two Rocks.” In ninth grade, my junior high school’s literary magazine published one of my poems. (Unfortunately, many years ago a flood that destroyed much of my early, pre-publication writing also destroyed my first publication.) I contributed to my high school’s literary magazine, wrote for (and later edited) my high school newspaper, wrote for an underground newspaper while in high school, and published a science fiction fanzine while contributing to other fanzines. 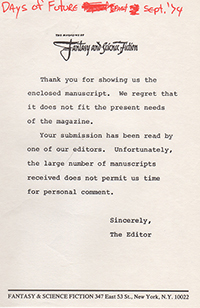 I also began submitting fiction to professional publications, receiving my first rejection from The Magazine of Fantasy and Science Fiction in September 1974. So, while other young men my age were tossing footballs and sinking free throws, I spent my high school years pounding the keyboard. During the spring and summer of 1976, I wrote “The Magic Stone”—a 1,200-word fantasy about a young boy, an elderly woman, and a magic stone—and submitted it to various SF/F magazines. After the story earned several rejections, I sent it to Donn Brazier, who published “The Magic Stone” in the February 1977 issue of his fanzine Farrago. (Farrago, a limited-circulation amateur publication produced on a photocopier, was an offshoot of his more popular fanzine Title.) The response was positive, and someone suggested “The Magic Stone” was a wonderful children’s story. I’m not certain I knew then that what I was about to do was wrong, but I submitted the story to several children’s magazines without mentioning that it had already been published. When Young World accepted the story, I remained mum, and by the time “The Magic Stone” appeared in the November 1978 issue, I was 21 and fully committed to my crime. So, the truth is that I wrote “The Magic Stone” when I was 18, it was first published when I was 19, but it didn’t achieve professional publication until I was 21. Though my professional writing career began with a literary crime, I didn’t become a crime fiction writer until several years later. Next time, I’ll explain how and why I made the transition. I am currently reading submissions for The Eyes of Texas, an anthology of private eye stories that Down & Out Books will release at the 2019 Bouchercon in Dallas. The deadline is November 30, and the guidelines and answers to FAQs can be found here: http://www.crimefictionwriter.com/TheEyesOfTexas.htm. Looks like I'm the first to comment. WELCOME, Michael. Look forward to your posts. This one grabbed me. My first published story came out the student magazine of the University of New Orleans. Also a fantasy. Years of rejections followed. Deservedly. Didn't feel that way at the time. It took a while to learn the craft. I hope you keep the narrative going on how you progressed. A good reminder of the importance of student and amateur publications in building a successful writer. I knew I wanted to write early, too, and my first efforts were blatant rip-offs of the Hardy Boys. Fortunately, I didn't know enough to send them out (I was only ten or eleven). But publication and I were like a couple that never quite gets together until late in life, and I abandoned writing for theater. My first published story appeared when I was sixty, so you beat me by over 40 years. O'Neil and Janice: Amateur, small press, and student publications of various kinds give many of us our first tastes of publication. Though my earliest publications were in junior high, high school, and college publications, I also contributed to many science fiction fanzines of the day, and I know several professional writers who also had their earliest work published in them. I don't remember ever trying to imitate specific series (like Steve and Eve), but I definitely wanted to be the next Isaac Asimov or Robert Heinlein! That didn't work out. Michael, my first published story sold to Easyriders magazine for $250, but DEA agents weren't allowed at that time to have second occupations (even writing for money)(NOTE: I asked twice and got turned down both times), so it was published under a street nickname with the check made out to an alias. Guess us two hardened criminals will just have to learn to live with our crimes as best we can. What a great post, Michael! R.T. : Though we can't hold a candle to the criminal activities of mystery writer Al Nussbaum, do our literary crimes make us the bad boys of crime fiction? Pamela: Thank you for your kind words. Just noticed the picture of you as a cute kid. What the hell happened? Looks like my second posting that I don't have to prove I'm a robot. O'Neil: I became a writer. It wears on you. And the low pay means I can't afford the fancy duds my mother put me in. I won an essay contest in high school, Michael, and that's when I knew I'd be a writer someday. That day was a long time coming, but it finally arrived, and there's no way I can get out of it now. I'm doomed -- or blessed -- depending on how my writing is going on any given day. Great post, Michael. Looking forward to reading more of them. 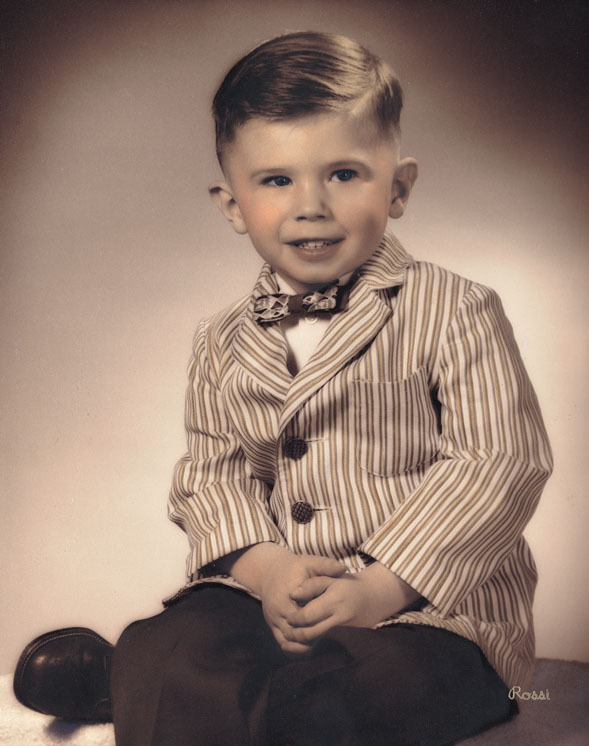 Enjoyed this introduction here--Michael in his early years! Looking forward to the next installment! The jig is up, Michael! I hope the short-story cops aren't hot on your trail now. Welcome to SleuthSayers. And, O'Neil, I have a client who looks just like your thumbnail, minus the mustache. Small world. Earl: We can't all be award-winning writers from the get-go. Some of us had to work up to it. Thanks for the kind comments Su, Art, and Barb. And, Barb, I don't think the short-story cops are on my tail yet, but if they catch me, I'll roll over on R.T. and see if I can work out a deal. We moved a lot when I was a kid. Found out years later my father is part gypsy. The first thing we did when we arrived in a new town was find the library and get our new cards. This was a fun post! My visits to the library and the books I checked out were an important part of my childhood, Catherine, and I'm glad they were for you, too! That I am old enough to know who both Buddy Hackett and Earl Wilson were frightens me, Josh. Enjoyed this column, Michael. Unlike you, I started writing later in life--I envy those of you who realized early that you wanted to tell stories. As I've said before, it's great to have you here at SleuthSayers! NaNoWriMo - National Novel Writing Month!